Harley came into rescue as Meatwad, a shy 4 and 5 year old all natural black and rust male. Once he trusts you, he is so loving and attentive to his humans and he has a playful personality. He is a neutered, up to date on his shots, micro chipped male with the cutest face and waggiest taileyou have ever seen! He was found tied to a pole in front of a PetSmart and taken in by a cat rescue. Once he started chasing the kittens he wasn’t very welcome and he came in to MinPinHaven Rescue. 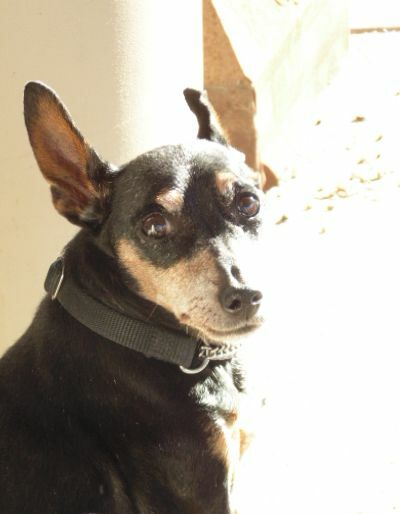 MinPins are hunters…and he is good at it! His natural tail is always wagging and his ears are erect and give expression to his smiling face. He wants an active family for walks and car rides cause he loves to be with his favorite people! Once comfortable he will chase the other dogs to get them to play with him!!!! He loves attention and is very lovable in return - he loves belly rubs and will fall asleep on his back enjoying long belly rubs given the chance. He will need obedience training to gain confidence and to understand what you want him to do but once he knows what you expect of him, he is very smart and wants to please his humans! Harley is neutered, up to date on his shots, micro chipped and has had a recent dental. Is your family ready to share your home with a loving little guy in search of his forever home?